Celebrate the Centennial of Flight in your classroom by forecasting the weather! 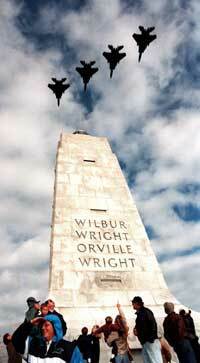 The Wright Brothers National Memorial. Kitty Hawk, North Carolina. December 17, 2003. 10:35AM EST. The 2003 Flight Forecast online program challenges K-12 students to predict the weather conditions for flight at the Centennial of Flight celebration at the Wright Brothers National Memorial in Kitty Hawk, North Carolina on December 17, 2003. December 17, 1903 was a cold, damp, windy day with temperatures below freezing and steady winds blowing at 27 miles per hour. What will the weather be for 2003? Use the online activities to prepare students for the challenge. The central activity of the 2003 Flight Forecast program is the analysis of historical weather data as a basis for making a prediction for this year. Other activities include an exploration of ideas in aviation and meteorology. All activities are aligned with the appropriate national science and/or math standards. Forecasts will be collected in three grade groupings: K-4, 5-8, and 9-12. The complexity of the forecast increases at each higher grade group.